I spent all weekend painting, cutting holes in the wall and running wires and cables everywhere. This is where we stand as of today. I really like the colors. They all seem to go together. The speakers on the walls look nice also. I get tired of seeing only black. That's why all of my future purchases for the living room will be in Cinnamon Beech. Thanks guys! Yeah black is boring, I'd much rather have a natural wood looking finish and some subtle color on the walls. Our next step is painting the ceiling the same color and then doing some crown molding work to hide that last wire (and some work on the ceiling too). The next phase is either a larger display or some theater seating. I'm still not sure which at this point. Very, very nice Vic ... I really like the earth tone colors you chose, congrats! But what's with the wicker dust bin? I just needed some place to store all of our remotes/game controllers. That was all I could find at the moment. You have create a nice room. I like the space you have ! 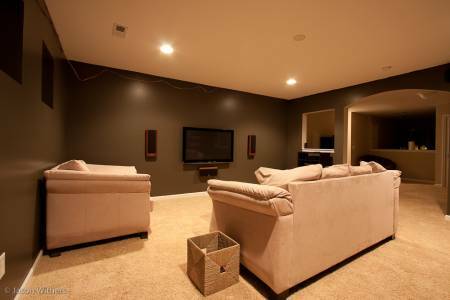 I think a projector and 100 inch, or bigger, screen would go nice in that room.